Nuh ibn Asad was a Samanid ruler of Samarkand (819-841/2). He was a son of Asad. Ahmad was a Samanid ruler of Ferghana (819-864/5) and Samarkand (851/2-864/5). He was a son of Asad. Yahya was a Samanid ruler of Shash (819–855) and Samarkand (851/852–855). He was a son of Asad. Abū 'Abd Allāh Ja'far ibn Muḥammad al-Rūdhakī, better known as Rudaki (رودکی), and also known as "Adam of Poets", was a Persian poet regarded as the first great literary genius of the Modern Persian language. Ibn Sina, also known as Abu Ali Sina, Pur Sina (پورسینا), and often known in the west as Avicenna was a Persian polymath who is regarded as one of the most significant physicians, astronomers, thinkers and writers of the Islamic Golden Age. He has been described as the father of early modern medicine. Of the 450 works he is known to have written, around 240 have survived, including 150 on philosophy and 40 on medicine. The eponymous ancestor of the Samanid dynasty was Saman Khuda, a Persian noble who belonged to a dehqan family, which was a class of land-owning magnates. The original home of the Samanids is unclear, for some Arabic and Persian texts claim that the name was derived from a village near Samarkand, while others assert it was a village near Balkh or Tirmidh. The latter is more probable since the earliest appearance of the Samanid family appears to be in Khorasan rather than Transoxiana. 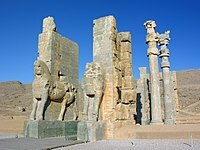 In some sources the Samanids claimed to be descended from the noble Mihran family of Bahram Chobin, whereas one author claimed that they belonged to the Turkish Oghuz tribe, although this is most unlikely. Originally a Zoroastrian, Saman Khuda converted to Islam during the governorship of Asad ibn Abdallah al-Qasri in Khorasan,  and named his oldest son as Asad in the governor's honour. In 819, the governor of Khorasan, Ghassan ibn Abbad, rewarded the four sons of Asad for their aid against the rebel Rafi ibn al-Layth; Nuh received Samarkand; Ahmad received Farghana; Yahya received Shash; and Ilyas received Herat. This marked the beginning of the Samanid dynasty. Saman Khuda was an 8th-century Persian noble whose descendants later became rulers of Persia. He was a Dehqan from the village of Saman in Balkh province in present-day northern Afghanistan. In the early 8th century, he came to Merv, seat of the Caliphal governor of Khorasan, Asad ibn 'Abd Allah al-Qasri. Saman was originally a Zoroastrian. However, he was so impressed with the piety of Asad ibn 'Abd-Allah al-Qasri, the Caliphal governor of Khorasan, that he converted to Islam. He named his son Asad, allegedly in the governor's honor. The dihqan, were a class of land-owning magnates during the Sasanian and early Islamic period, found throughout Iranian-speaking lands. Ilyas died in 856, and was succeeded by his son Ibrahim ibn Ilyas—the Tahirid governor of Khorasan, Muhammad ibn Tahir, thereafter appointed him as the commander of his army, and sent him on an expedition against the Saffarid ruler Ya'qub ibn al-Layth al-Saffar in Sistan. He was defeated at a battle near Pushang in 857, and fled to Nishapur, where he was captured by Ya'qub al-Saffar and sent to Sistan as a hostage. The Tahirids thereafter assumed direct control over Herat. In 839/40, Nuh seized Isfijab from the nomadic pagan Turks living in the steppe. He thereafter had a wall constructed around the city to protect it from their attacks. He died in 841/2—his two brothers Yahya and Ahmad, were then appointed as the joint rulers of the city by the Tahirid governor of Khorasan. After Yahya's death in 855, Ahmad took control over Châch, thus becoming the ruler of most of Transoxiana. He died in 864/5; his son Nasr I received Farghana and Samarkand, while his other son Ya'qub received Châch (areas around modern Tashkent/Chachkent). Meanwhile, the Tahirids authority had significantly weakened after suffering several defeats by the Saffarid ruler Ya'qub al-Saffar, thus losing their grip over the Samanids, who became more or less independent. Nasr I used this opportunity to strengthen his authority by sending his brother Isma'il to Bukhara, which was in an unstable condition after suffering from raids by the Afrighid dynasty of Khwarazm. When Isma'il reached the city, he was warmly received by its inhabitants, who saw him as one who could restore order. Although the Bukhar Khudahs continued to autonomously rule in Bukhara for a few more years. In 900, Isma'il sent an army under Muhammad ibn Harun al-Sarakhsi against Muhammad ibn Zayd, the Zaydi ruler of Tabaristan and Gorgan. The invasion was successful; Muhammad ibn Zayd was killed and Tabaristan was conquered by the Samanids. However, Muhammad ibn Harun shortly revolted, making Isma'il himself invade the region the following year. Muhammad ibn Harun thereafter fled to Daylam, while Isma'il reconquered Tabaristan and Gorgan. In 901, Amr Saffari was defeated at the battle of Balkh by the Samanids, which reduced the Saffarid dynasty to a minor tributary in Sistan. It was during this period that the Samanids were at their height of power, ruling as far as Qazvin in west  and Peshawar in the east. Not long after his accession, Ahmad invaded Sistan; by 911, Sistan was under complete Samanid control, and Ahmad's cousin Abu Salih Mansur was appointed as its governor. Meanwhile, an Alid named Hasan al-Utrush was slowly re-establishing Zaydi over Tabaristan. In 913, Ahmad sent an army under Muhammad ibn Sa'luk to deal with him. Although the Samanid army was much larger, Hasan managed to emerge victorious. Ahmad, before he could plan another expedition to Tabaristan, was the following year murdered by some of his slaves in a tent near Bukhara. During his reign, Ahmad is also said to have replaced the language of the court from Persian to Arabic, which made him unpopular among his subjects, and forced him to change it back to Persian. After Ahmad's death, his eight-year-old son Nasr II (r. 914–943) succeeded him. Due to Nasr's youth, his prime minister Abu 'Abd-Allah al-Jaihani took care over most of the state affairs. Jaihani was not only an experienced administrator, but also a prominent geographer and greatly educated man. Almost right after Nasr II had ascended the throne, several revolts erupted, the most dangerous one being under the uncle of his father, Ishaq ibn Ahmad, who seized Samarkand and began minting coins there, while his son Abu Salih Mansur seized Nishapur and several cities in Khorasan. Ishaq was eventually defeated and captured, while Abu Salih Mansur died of natural causes in 915. Some time later Nasr II once again had to deal with rebels; in 919, the governor of Khorasan, Husayn ibn Ali Marvarrudhi, rebelled against Samanid authority. Nasr responded by sending an army under Ahmad ibn Sahl to suppress the rebellion, which the latter managed to accomplish. After a few weeks, however, Ahmad shortly rebelled himself at Nishapur, made incursions into Gorgan, and then fortified himself in Merv to avoid a Samanid counter-attack. Nevertheless, the Samanid general Hamuya ibn Ali managed to lure Ahmad out of Merv, and defeated him in a battle at Marw al-Rudh; he was captured and imprisoned in Bukhara, where he remained until his death in 920. In the west, Nasr II clashed several times with Daylamite and Gilite rulers; In 921, the Zaydids under the Gilite ruler Lili ibn al-Nu'man invaded Khorasan, but were defeated by the Simjurid general Simjur al-Dawati. Later in 930, a Dailamite military leader, Makan ibn Kaki, seized Tabaristan and Gurgan, and even took possession of Nishapur in western Khorasan. He was, however, forced to withdraw back to Tabaristan one year later, due to the threat that Samanids posed. Makan then returned to Tabaristan, where he was defeated by the Ziyarid ruler Mardavij, who managed to conquer the region. In 935, Nasr II re-established Samanid control in Gurgan and made Mardavij's successor Vushmgir his vassal. However, in 939 he declared independence, but was defeated the following year at Iskhabad. The power of the Samanids began to crumble in the latter half of the 10th century. In 962, one the ghulams, Alp Tigin, commander of the army in Khorasan, seized Ghazna and established himself there. His successors, however, including Sebük Tigin, continued to rule as Samanid "governors". With the weakened Samanids facing rising challenges from the Karakhanids for control of Transoxiana, Sebük later took control of all the provinces south of the Oxus and established the Ghaznavid Empire. In 992, a Karakhanid, Harun Bughra Khan, grandson of the paramount tribal chief of the Karluk confederation Sultan Satuq Bughra Khan, captured Bukhara, the Samanid capital. Harun died shortly afterwards, however, and the Samanids returned to Bukhara. In 999, Nasr b. Ali, a nephew of Harun, returned and took possession of Bukhara, meeting little resistance. The Samanid domains were split up between the Ghaznavids, who gained Khorasan and Afghanistan, and the Karakhanids, who received Transoxiana; the Oxus River thus became the boundary between the two rival empires. Example of figural earthenware ceramics from Samanid period. Nuh II was amir of the Samanids (976–997). He was the son and successor of Mansur I.
Isma'il was an individual who attempted to resurrect the Samanid state in Transoxiana and eastern Iran (1000–1005). He was the son of Nuh II. Nasr I was amir of the Samanids (864/865–892). He was the son of Ahmad ibn Asad. Ahmad ibn Ismail was amir of the Samanids (907–914). He was the son of Isma'il. He was known as the "Martyred Amir". Nuh ibn Nasr, or Nuh I, was the amir of the Samanids in 943–954. He was the son of Nasr II. It is rumoured that he married a Chinese princess. Abū Ibrāhīm Ismā'īl ibn Aḥmad, better simply known as Isma'il ibn Ahmad, and also known as Ismail Samani, was the Samanid emir of Transoxiana (892–907) and Khorasan (900–907). His reign saw the emergence of the Samanids as a powerful force. He was the son of Ahmad ibn Asad and a descendant of Saman Khuda, the eponymous ancestor of the Samanid dynasty who renounced Zoroastrianism and embraced Islam. Nasr ibn Ahmad or Nasr II, nicknamed "the Fortunate", was the ruler (amir) of Transoxiana and Khurasan as the head of the Samanid dynasty from 914 to 943. His reign marked the high point of the Samanid dynasty's fortunes. He was the son of Ahmad ibn Isma’il. The Al-i Muhtaj or Muhtajids was an Iranian or Iranicized Arab ruling family of the small principality of Chaghaniyan. They ruled during the 10th and early 11th centuries. Chaghaniyan, known as al-Saghaniyan in Arabic sources, was a medieval region and principality located on the right bank of the Oxus River, to the south of Samarkand. Abu Salih Mansur was a Samanid prince, who served as governor during the reign of his uncle Isma'il ibn Ahmad, his cousin Ahmad Samani, and Nasr II. Ahmad ibn Sahl ibn Hashim was an Iranian aristocrat who served the Saffarids and later the Samanids. Abu'l-Husain Abd-Allah ibn Ahmad Utbi, better known as Abu'l-Husain Utbi, was an Iranian statesman from the Utbi family, who served as the vizier of the Samanid ruler Nuh II from 977 to 982. Ibrahim ibn Simjur was a Samanid military officer from the Simjurid family. Ali ibn Hasan, also known as Harun Bughra Khan and better known as Ali-Tegin was a Karakhanid ruler in Transoxiana from 1020 to 1034 with a brief interruption in 1024/5. Böritigin, also known as Ibrahim ibn Nasr or Tamghach Khan Ibrahim, was a Karakhanid ruler in Transoxiana from 1038 to 1068. He was one of the greatest ruler of the dynasty. ↑ Taagepera, Rein (1997). "Expansion and Contraction Patterns of Large Polities: Context for Russia". International Studies Quarterly. 41 (3): 475–504. doi:10.1111/0020-8833.00053. JSTOR 2600793. ↑ Peacock, A. C. S.; Tor, D. G. (2017-08-30). Medieval Central Asia and the Persianate World: Iranian Tradition and Islamic Civilisation. Bloomsbury Publishing. p. xix. ISBN 9780857727435. ↑ Grube, Ernst J. (February 1965). "The Art of Islamic Pottery". The Metropolitan Museum of Art Bulletin. 23 (6): 209–228. doi:10.2307/3258167. ISSN 0026-1521. JSTOR 3258167. ↑ Pancaroglu, Oya. "Serving wisdom: The contents of Samanid epigraphic pottery." Studies in Islamic and Later Indian Art from the Arthur M. Sackler Museum, Harvard University Art Museum (2002): 58-68. Wikimedia Commons has media related to Samanid Empire . Bosworth, C.E. (1968). "The Development of Persian Culture under the Early Ghaznavids". Iran. 6: 33. doi:10.2307/4299599. JSTOR 4299599. Shahbazi, A. Shapur (2005). "SASANIAN DYNASTY". Encyclopaedia Iranica, Online Edition. Retrieved 23 January 2016.